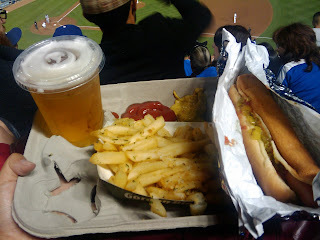 Hungry Kat: Dodger Dog, Garlic Fries and Beer! 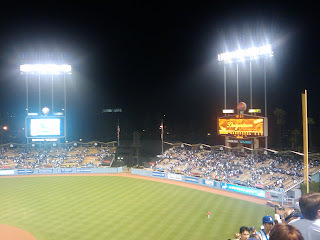 A Cardinals fan took me to my first baseball game ever at the Dodger Stadium (thank you Coolia!) this past Wednesday and boy, did I have a good time. And yes, yes, I've lived in LA all my life and somehow managed to never cross paths with baseball save for some pathetic attempts to play during P.E. in high school. 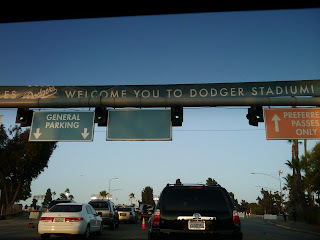 Anticipation had been building for a couple of weeks and I was all smiles when we finally entered the parking queue into Dodger Stadium. The outside of the stadium is really nice...anticipation and excitement continued to build. Before we settled down in our seats, Coolia and I had to do something of extreme importance. 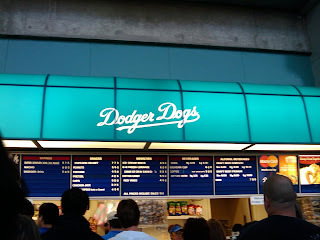 Stand in line for our Dodger Dog, Garlic Fries and Beer! Oh, yes and some Cracker Jack too. The stadium was packed. It was cool to see Pujols steal to second base (and Coolia told me he's a slow runner too) and Manny shatter his bat into pieces. 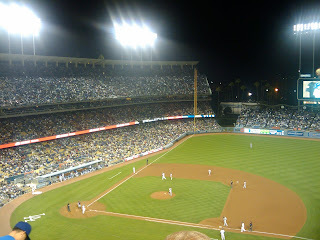 Going into the 9th inning was nail-biting because the score was 2 for 2. Cardinals won 3 to 2! People started filing out immediately as soon as the game ended. Coolia was very happy...Dodgers fans not so much. 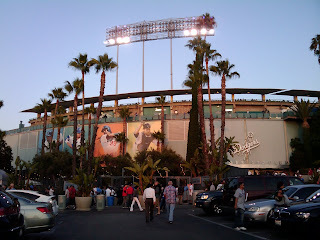 I had a great time at my first baseball game. I loved the energy and pulse of the crowd (about 40,000 were there?). Coolia made sure we had all the "must haves" because a baseball game is not a baseball game unless you eat, drink and partake in other very amusing activities like cheering, heckling fans of the opposing team, singing "Take Me Out to the Ball Game" at the 7th inning, tossing beach balls from section to section, and in our case, someone was tossing a blow-up doll around until the ushers came and took it away. There was even a marriage proposal! Not to me of course. A guy proposed to his girlfriend on the Kiss-cam and luckily for him, she accepted. I don't think you can really refuse a marriage proposal when its made in such public proportions. And much, much thanks to Coolia for patiently answering all my baseball questions. I would have been totally lost otherwise. Conclusion: very high bar set for next baseball game.